St Luke's Anglican School caters for 820 students from kindergarten to Year 12 near Bundaberg in the Australian state of Queensland. Established in 1994 and situated on a 32-hectare campus, St Luke’s has about 80 teachers and 40 support and administration staff. St Luke’s traditionally ran its core business applications on a virtualized infrastructure on its on-premises data center. These included applications for productivity and e-mail, as well as TASS.web, a web-based school administration system to manage payroll, accounts and students. The virtualized infrastructure also ran some file components of the school website, www.stlukes.qld.edu.au, which provides information about the school to prospective students, parents and other interested parties. However, low bandwidth Internet connections made downloading local files, (for example, fee structures and mission statements) from the website slow. The remainder of the website ran on an infrastructure provided by an Australian Internet provider, and the school found this was not flexible or cost-effective enough to meet its needs. St Luke’s also experienced occasional power outages that forced teachers and administration staff to temporarily adopt paper-driven processes. The outages also led to lost data, frustrating teachers and administrators and reducing productivity. Furthermore, St Luke’s location in Bundaberg made it vulnerable to natural disasters, including local flooding. The school identified an on-campus fire as another risk. St Luke’s technology team realized that continuing to host its applications on-site was impractical. “In mid-2011, we moved our full website to a cloud hosting provider in Japan, and later that year migrated our business productivity software to an online suite of applications,” says Mitch Miller, the School’s IT Manager. "However, the hosted website environment in Japan was expensive and delivering unacceptably slow page loading times." The TASS.web system was still running on-premises when a flood in 2013 effectively cut one side of Bundaberg off from the other, stopped power for 36 hours and shut the school down for a week. At that point, St Luke’s decided to move TASS.web into an environment where it could continue to operate in case of natural disaster. “This would allow us to use the system’s capabilities to mark off student rolls electronically on smartphones or iPads from evacuation points, rather than continuing to print copies daily in case of emergency,” says Miller. St Luke’s also wanted to take advantage of TASS.web’s ability to send mass updates to parents about emergencies and use TASS.web to create a virtual campus while its buildings were being repaired, ensuring students’ education was not disrupted. Additionally, the technology team’s ability to perform software upgrades, general maintenance, endpoint deployments and other tasks was constrained because they had to dedicate two team members to reconfigure its on-premises infrastructure for two-month periods every three years. The school began to look for an affordable, scalable cloud solution that would offload infrastructure overhead. Hosting the school’s website in the Asia Pacific (Sydney) Region closer to its users would reduce page-loading times, manage costs effectively, and provide access to support resources in the same time zone. The availability of the AWS platform would support TASS.web functions such as electronic roll call and the operation of a virtual campus. The school’s evaluation found that AWS Cloud resources were more scalable than those of other cloud provider, and the Amazon Virtual Private Cloud (Amazon VPC) would allow St Luke’s to provision a logically isolated section of the AWS Cloud where administrators could closely control access to applications, services and infrastructure. St Luke’s migrated its website to AWS in early 2013 and TASS.web to the AWS Cloud in July 2014. The website runs on one t2.small Amazon EC2 instance, using Amazon Route 53 for domain name services. Amazon Simple Storage Service (Amazon S3) stores up to 5GB of static web content. 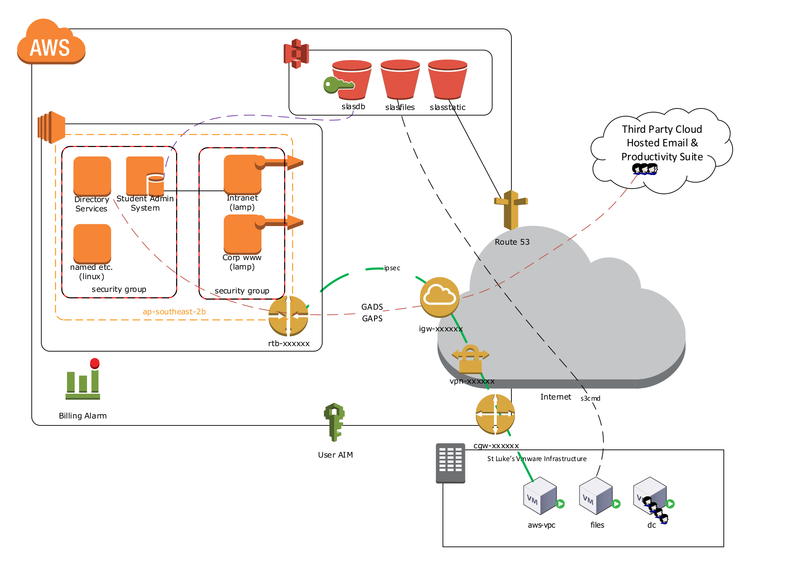 The TASS.web system—written in Adobe ColdFusion and which accesses a SQL Server database—operates on one r3.large Amazon EC2 instance, with three domain controllers running on Amazon EC2 instances for different sub-domains providing authentication services. For disaster recovery and backup, the TASS.web system is copied daily and backed up to an Amazon S3 bucket. St Luke’s operates both the website and TASS.web cloud environment in an Amazon VPC. A virtual private network (VPN) links the AWS environment to St Luke’s local area network. The school also backs up 60GB of data from its file servers — that continue to run in its on-premises infrastructure — to Amazon S3 nightly as an automated component of its business continuity planning. St Luke’s uses AWS Identity & Access Management to provide its IT team with role-based access to the development, test and production environments running in the Amazon VPC. Figure 1 below describes St Luke’s environment on the AWS Cloud. As a next step, St Luke’s will snapshot its important Amazon EC2 machines and use AWS Storage Gateway to replicate all file stores to Amazon S3. Over the next 12 months, the IT team plans to migrate its file servers, Windows support infrastructure, maintenance and IT ticketing systems from its on-premises infrastructure to the AWS Cloud. The school’s final activity will be to review the technology assets left on-site at the school and tear down any that are no longer needed. By migrating its website and TASS.web system to the AWS Cloud, St Luke’s has achieved near 100 percent infrastructure availability for both systems, meaning teachers can complete student roll calls electronically without being concerned about losing roll data during emergencies. Miller is also confident that staff and students will be able to use TASS.web as a virtual campus in case of natural disaster. The school expects to achieve considerable savings when the transition to the AWS Cloud is fully complete in 18 months. “We estimate reducing capital costs by 75 percent and data center operating costs by about 40 percent once we complete the move to AWS,” says Miller. St Luke’s has also seen its website latency fall to just 20 milliseconds by hosting it in the Sydney Region — down from 160 milliseconds from its previous environment and considerably improving the user experience. To learn more about how AWS can help your web application needs, visit our Web & Mobile Apps details page: http://aws.amazon.com/web-mobile-social/.